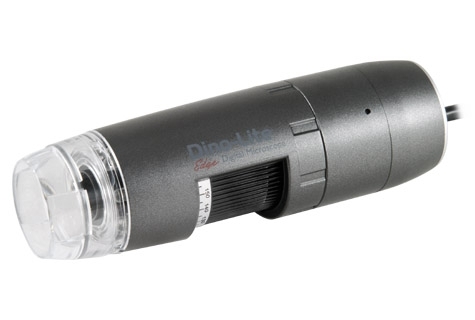 The Dino-Lite AM5216TL is one of the latest Edge series D-sub microscopes with long working distance (LWD) feature. 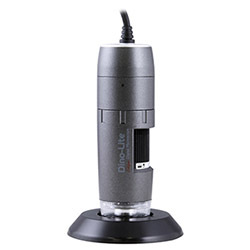 When compared to standard magnification models like the AM5216T, this LWD model yields higher magnification and larger depth of field under the same working distance though the highest attainable magnification is smaller. This feature provides greater clearance between the microscope and the viewing object, which can be helpful for applications such as repairing or assembling. The MicroTouch button on this model is configured to quickly freeze video frames with a single tap of a finger, or to control on/off the LEDs. The scroll lock on the magnification dial is able to secure the dial and fix the focus and magnification, which can be helpful to prevent unintentional rotations of the dial in some applications. The AM5216TL does not require a computer or bundled software to operate, but instead functions through a VGA monitor connected via the D-sub interface. Thanks to the simplicity of system configuration and minimized maintenance requirement, the largely reduced overall system and operating cost together with the high image quality makes it ideal for use beyond industrial application.